The town of Belmont, it turns out, offers two such spots. For fresh, solid Italian food and evening themes—Wednesday is Girls Night Out and Thursday is reserved for live jazz—try Savinos Grill (www.savinosgrill.com). The place has a friendly staff and warm-toned décor (creamy whites and autumnal rust), along with inventive triangular-shaped partitions that jut out from the main walls, offering privacy to many tables, and welcome dimensionality in the otherwise boxy space. Most important: the bar, close to the entrance, is tiny, which precludes any gathering of loud drinkers. 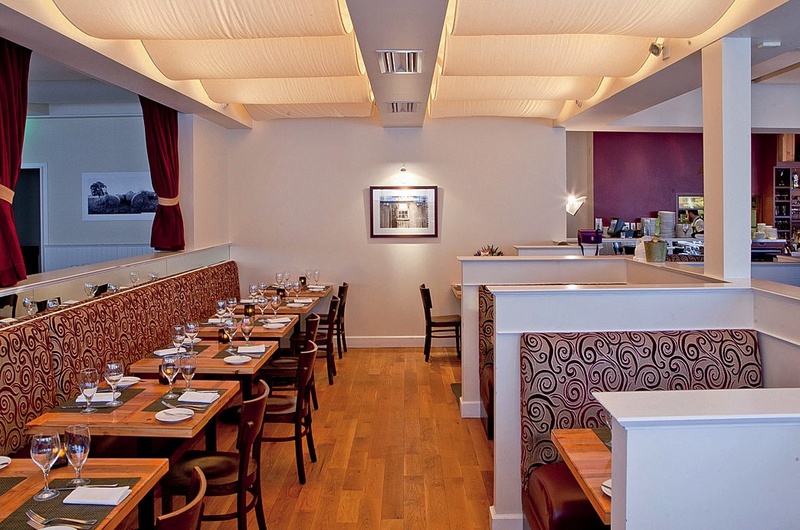 More polished and a little less muted is West Newton’s Lumière (www.lumiererestaurant.com). 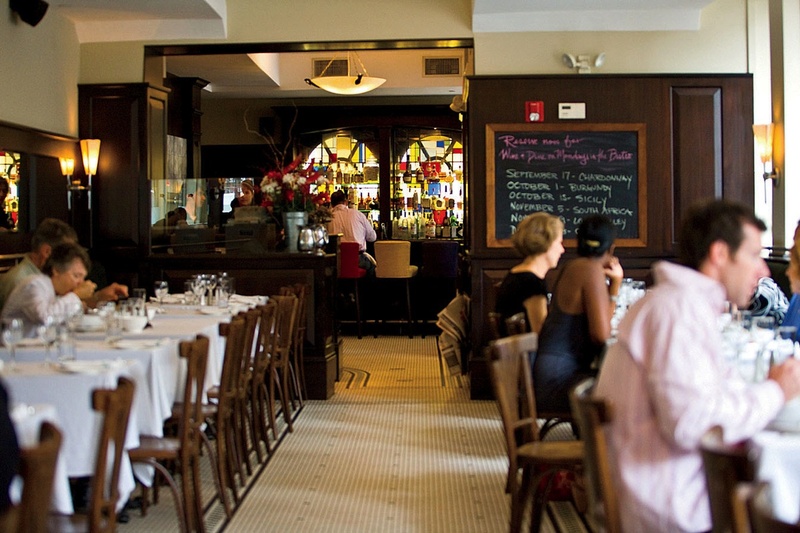 From a nuanced color scheme and velvet curtains to flattering mood lighting, this established French bistro fosters calm consumption of its meticulously prepared food. Plan for an early movie at the West Newton Cinema, down the street, then linger over dinner and dessert. We recommend the dark chocolate crémeux with coconut cream and salted rum caramel ($12). Sycamore (www.sycamorenewton.com) is newer, and newly lauded with a 2015 nod from Boston Magazine’s “Best of Boston” list. The Newton Centre restaurant has a hip vibe amid naturalistic décor: lots of wood, exposed brick, and a few soft brown banquettes. Mature Newtonians mix with younger folks; all seem devoted to chef David Punch (formerly of Ten Tables in Cambridge) and his inventive Mediterranean-style dishes, which bring out the best in any vegetable. Pickled ramps, fried okra, charred Japanese eggplant, and a chanterelle mushroom soup topped the fall menu. Even smaller and quieter than Sycamore, however, is the nearby Farmstead Table (www.farmsteadtable.com). This modern space washed in white tones serves food with a rustic New England bent—slow-cooked meat and potatoes—and folksy desserts, like the “s’mores tart,” dressed up with ganache ($9). For quiet and cozy, the Beacon Hill Bistro, on the first floor of the eponymous hotel (www.beaconhillhotel.com), is a good bet. 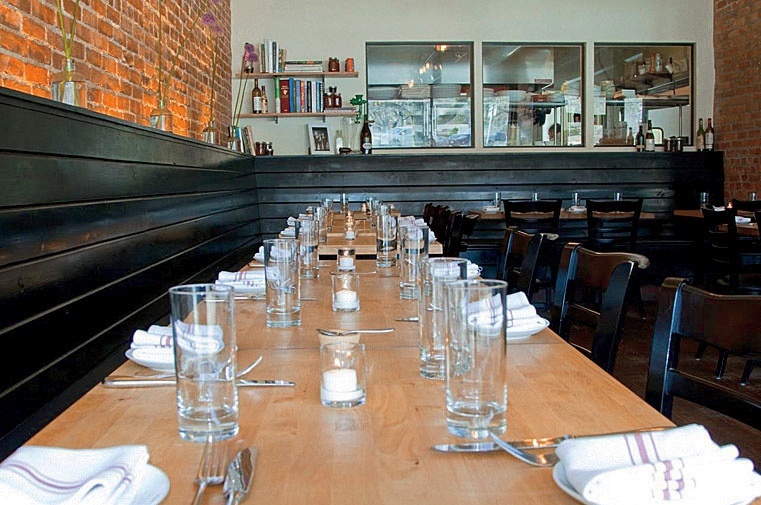 Even with 60 seats in a relatively small storefront space, the restaurant rarely seems overcrowded. Enjoy the French-styled comfort food in peace, then take a stroll down Charles Street, where window shopping at night can be more pleasurable than buying. Late nights at the Museum of Fine Arts (Wednesday through Friday) are also the best time to view exhibits. Crowds have likely waned at Class Distinctions: Dutch Paintings in the Age of Rembrandt and Vermeer, up through January 18, and Bravo (www.mfa.org) is open for drinks and “new American” cuisine at its festive bar or at a distinctly separate area with tables. Delightfully low-key jazz trios play on Friday nights. Nobody would call Changsho (www.changshorestaurant.com), another cherished standby, snug. 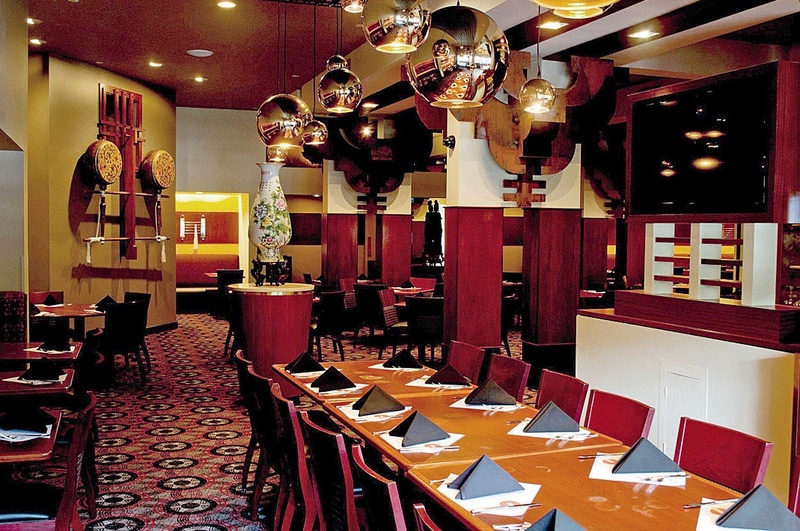 On Massachusetts Avenue a short walk from the Square, the restaurant seats upward of 180 people amid large-scale Chinese accoutrements that include vases, paintings, and string instruments. Yet Changsho is homey, thanks to all the family diners and to its well-spaced tables, warm spot lighting, and the large-patterned carpet that invisibly soaks up spilled tea and soy sauce. Somehow the acoustics here dull sounds—even those emanating from the large parties of chin-wagging academics often in attendance. For those desperate for serious quietude surrounded by floors of utter silence, there’s always the Boston Public Library’s Courtyard Restaurant (www.thecateredaffair.com/bpl/courtyard). It’s not open for dinner, but does serve a lovely, if pricey, lunch. Try the poached hen egg and bitter greens ($14) or the more grizzled open-face sirloin sandwich ($21). And the afternoon tea—the sample menu mentions raspberry thumbprints, scones with lemon curd, and savory cucumber and lemon cream-cheese sandwiches—might please even the pickiest Anglophile. But no lusty munching, or exclamations…Please!